HBP neuroscientist Gustavo Deco talks about his work with CHAMPMouse, an HBP partnering project investigating the circuitous network of connections that are activated when we do something as simple as distinguishing objects with our sight. 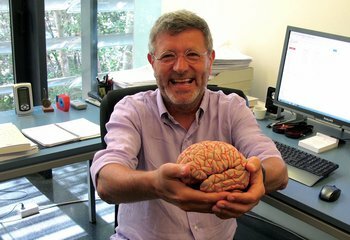 Neuroscientist Gustavo Deco jokes: "Basically, we do not know anything about the brain". The Argentine is a triple doctor in Physics, Computing and Psychology, and hopes that the joined efforts of all disciplines will reveal the secrets of the brain. With CHAMPMouse you are studying how visual perceptions occur in the brains of mice. Is that the main goal of the research? The question is to know how a particular cognitive function involves more than one brain area, perhaps a large part of the brain. We focus on a classic problem, which is the segregation of objects in a complex image. For example, if you have a white box on a white wall, you may not see it. On the other hand, if it was blue, it would be obvious. We call the fact that there is a kind of pop-up (emerging element) with respect to the general image ‘segregation’. That is, how we identify an object and segregate it from the rest of the image. We want to see how, in performing this task, many different areas of the brain communicate with each other. What brain areas do you think are involved in this process? After almost one century of neurophysiology we now know that there are related areas, such as the visual ones. But the beautiful aspect of the project is that we think that many regions in different parts of the brain will be involved in this task, including the subcortical areas such as the thalamus or different areas of the parietal cortex. Your team has published an article in bioRxiv in which you describe a method to study how the networks responsible for this process are configured. What does it consist of? When one has a measure of brain activity covering several regions, calcium imaging techniques are used. This way you can visualise activity in large areas of the brain. With an analysis of connectivity, we want to distinguish different phases in the processing of the visual segregation task. We have tested the method with humans to distinguish when they were not doing anything from when they were watching a movie. Since the model has differentiated well the two conditions, we now hope to be able to see which areas communicate with each other with mice and with different measures of object segregation. Is the perception process similar in the human brain and in the brain of mice? With some anatomical and behavioural differences, the basic principle is the same. If we see that the mouse uses the subcortical system, the thalamus, it is a good clue to take these areas into account in humans. CHAMPMouse is coordinated by the Neuroscience Institute of the Netherlands with the participation of the University of Leuven (Belgium). What are your team's tasks? To develop statistical and modelling methods to analyse the data they measure. From these data, information is extracted that could not be obtained without explicit modelling. The project started in January 2016 and will last three years. Where is it placed today? We have already started receiving data from awakened mice that are non-specialised in anything. This is already interesting to see which areas are communicated when one does not do anything. By the middle of the year we will receive the final data with the mouse performing the task. Applying the method, we will analyse and interpret the final result, to know which regions communicate with each other. What new lines of research will be opened once you have completed your work? Until now, neuroscience has been 'localisationist', that is, it tried to associate a task, a computation, a particular function to a neuron or a region. Today, the approach is holistic: we think that even the simplest tasks require a great integration of all the information that is distributed throughout the brain. The main goal of the project is to prove that this approach works well and to develop the techniques to perform these measurements on large scale animals. Within our group we have designed global reach models, which model the activity not of a neuron or a group in a localised region, but of the entire brain. What does the Human Brain Project mean for today´s neuroscience? For the first time in Europe, it has been possible to synchronise the different research groups in the area of neuroscience. Until now, cooperation was implemented through European or national projects in small groups. To understand how the brain works, a massive and global effort is needed. Neuroscience is multidisciplinary; there is no one person, no one group or no one university that could solve all the problems. A global, experimental, technological, computer and theoretical cooperation is needed, and the Human Brain Project tries to implement this philosophy. Yes. Basically we do not know anything [he laughs]. Neuroscience is in its infancy, although it has centuries of experimental tradition. The need to cooperate between experimentalists and theoreticians, evident in other disciplines, such as physics, has not been assumed in neuroscience until now. Although we have a lot of data, there are practically no theories to understand the brain. We have very vague, scattered and disordered knowledge. Everything is still to be done. In percentage terms, how much would you say we know? Since I have a physical-mathematical background, I refuse to give numbers when I do not know them [he laughs]. We do not know how much we can get to know. The limit is not clear. Although neuroscience and physics have long remained distant, they have much in common. The career of Gustavo Deco (Rosario, Argentina, 1961) demonstrates this interaction. Doctor in physics, in 1990 he was part of the Neural Computing team of the Siemens Research Center in Munich (Germany). Years later he received his doctorate in two new areas: Computer Science and Psychology. Elected Inventor of the Year in 2001 for his work on statistical learning and visual perception models, in 2012 the European Research Council awarded him an Advanced Grant to study how the brain processes information. With more than fifty patents awarded to him, Deco manages Brain and Cognition Center at the Pompeu Fabra University (Barcelona) and is a researcher at the Catalan Institution for Research and Advanced Studies (ICREA). The scientist is part of the Human Brain Project, the macro-project of the European Union that wants to unveil the mysteries of the human brain. He is a senior member of the Theoretical Neuroscience team and the HBP Partnering Project CHAMPMouse, run by the Neuroscience Institute of The Netherlands, he aims to find out which brain areas communicate with each other during visual perception.